Is your body in correct alignment? Take these self exams to see for yourself. Step 1. Stand barefoot - in shorts or underwear - in front of a full-length mirror, so that you can see from your knees down to your feet. Stand in a relaxed, normal position, facing the mirror. Close your eyes. March in place about 10 steps to position your feet naturally. If you answered “yes” to any of the above, your feet are probably pronated or supinated and are not providing proper support for your body. A balanced body is a happier body! A body that’s out of balance can be causing you pain anywhere from your feet all the way up to your neck. Custom-made Spinal Pelvic Stabilizer Orthotics are specially made just for your feet and for your unique postural condition. The joints in your body that bear weight (ankles, knees, hips, pelvis, low back, neck) are like links in a chain. If your feet aren’t balanced, every joint (and the connecting muscles, tendons, and ligaments) above may become injured over time due to unnatural twists and strains on your body. Pain may occur because of these postural imbalances. In addition, every time your feet hit the ground, a shock wave travels all the way through your body. 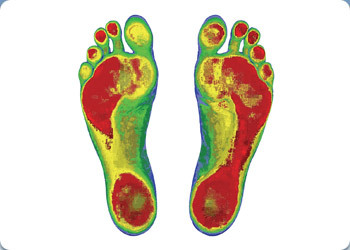 If your feet are balanced, they can absorb much of that shock. But if they’re not in balance, over time the shock can cause you additional stress/strain. Now you know why it’s so important to make sure your feet are giving you the proper support and protection your whole body needs. If they’re not, it’s time to ask your doctor whether Foot Levelers’ Spinal Pelvic Stabilizers could help you. Your postural condition is as unique to you as your fingerprint. Make sure you get the best orthotic for your health- one that features the patented Gait Cycle System®. Foot Levelers’ expert technicians analyze every individual foot impression we receive. Using 16 precise measurements, we create a custom-made Stabilizer that restores balance to the three arches of your feet. Different shoe styles require different stabilizers. As your activity changes, so does your shoe style.That’s exactly why you need a Foot Levelers Combo. Combos provide two pairs of stabilizers; one for shoes with laces and one for shoes without laces. This assures the continuous support your body needs for work, play and exercise. A variety of styles are available for all activity levels. Full-length and 3/4 length stabilizers fit a wide variety of shoe styles.